We had an early day the day before, and despite the fact that I really felt like I needed some time off we were still on track for doing Arches. 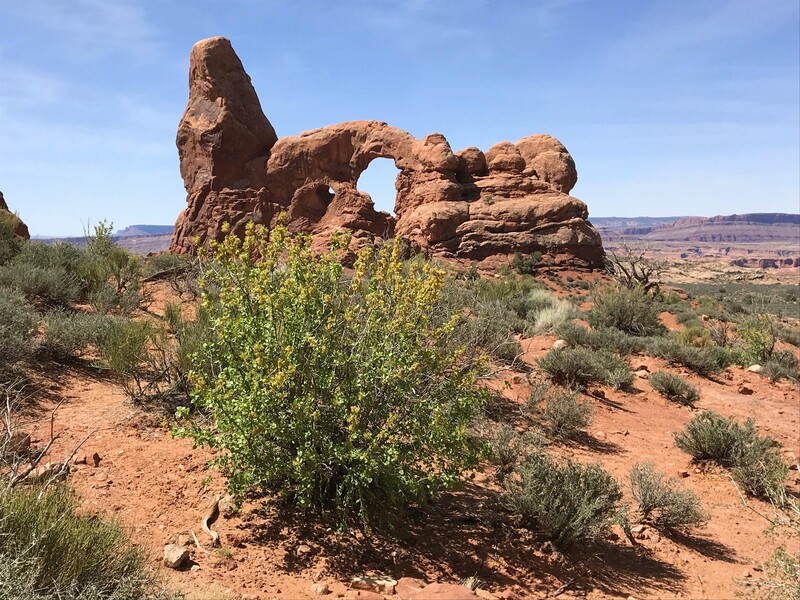 This National Park was one of the must do’s in Utah and we had scheduled it for Wednesday because it had the best forecast for the entire week. I actually felt pretty good when we got up early to head out and was pleased to find it had warmed up some, and more importantly, the wind had died down. 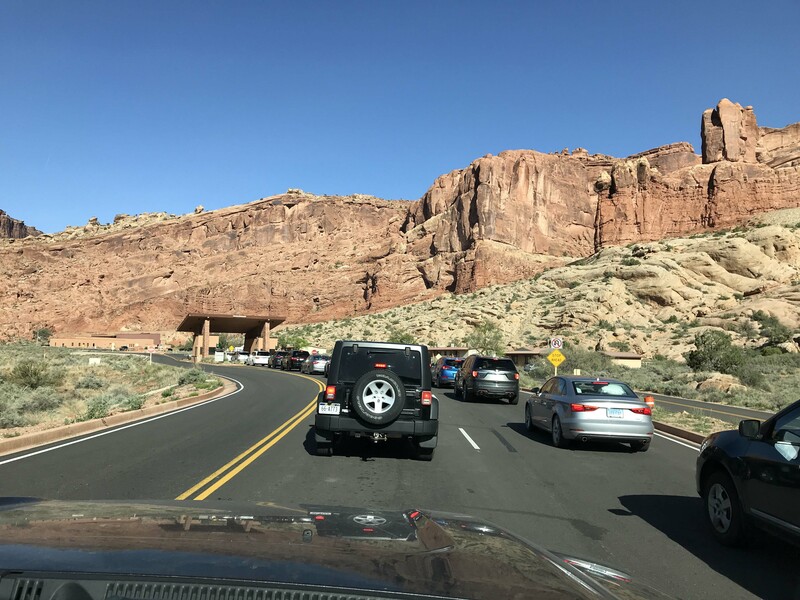 We ended up arriving at 9:16am and were a little surprised that there was already a line of about 20 cars waiting to get in. It’s a really big park though (we ended up driving about 50 miles inside of it), so it didn’t feel crowded at all until later in the day. Since we got a map at the gate, we decided to skip the visitors center until the end and head straight into the park. The drive in was gorgeous, although a little steep, but it evened out after the initial climb. You can see the black car on the middle right side of the picture. 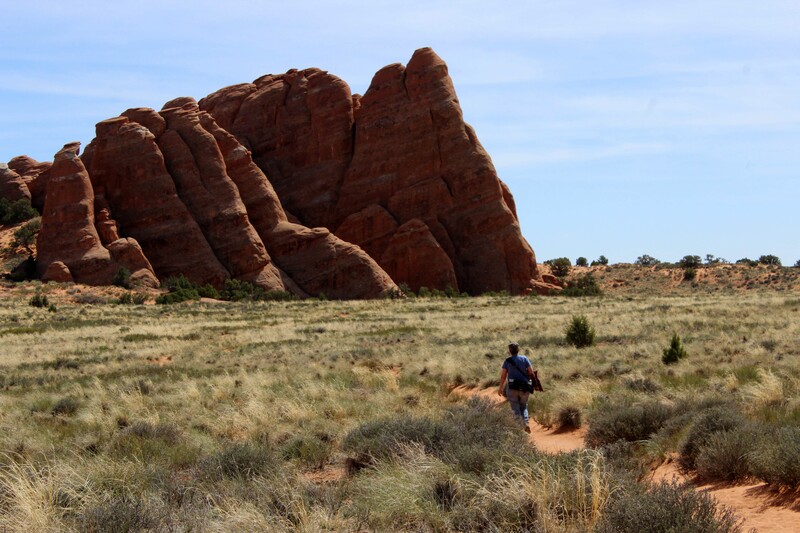 The first stop was Park Avenue, which was a one mile walk along some giant rock formations. 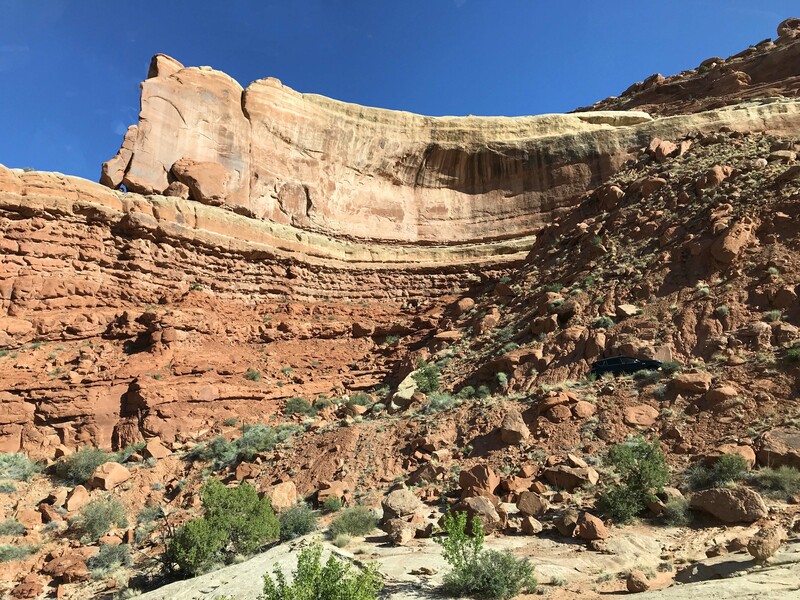 Not knowing what the crowd situation would be, I had decided to be a little strategic about where we stopped, so we just kept driving, stopping a few times to take pictures of the rock formations along the way. Sheep Rock which I absolutely loved. 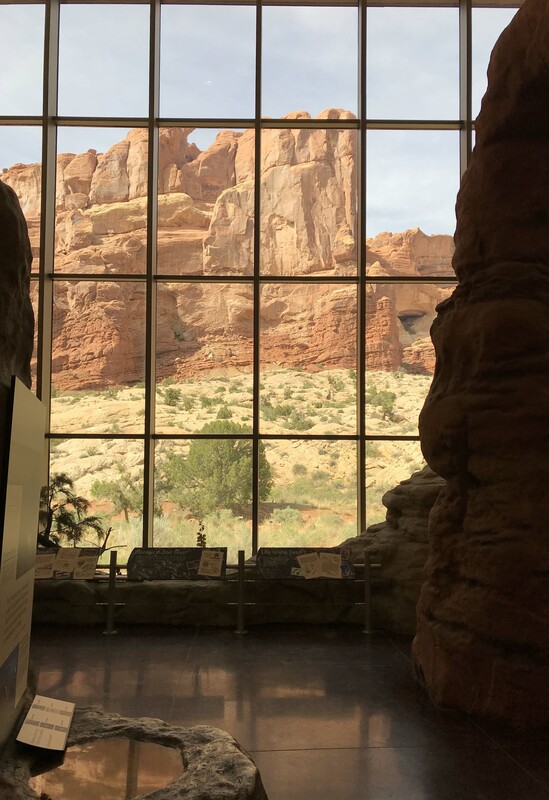 The next stop was for petrified sand dunes, and although it wasn’t the most picturesque I really wanted to see the information panel there. 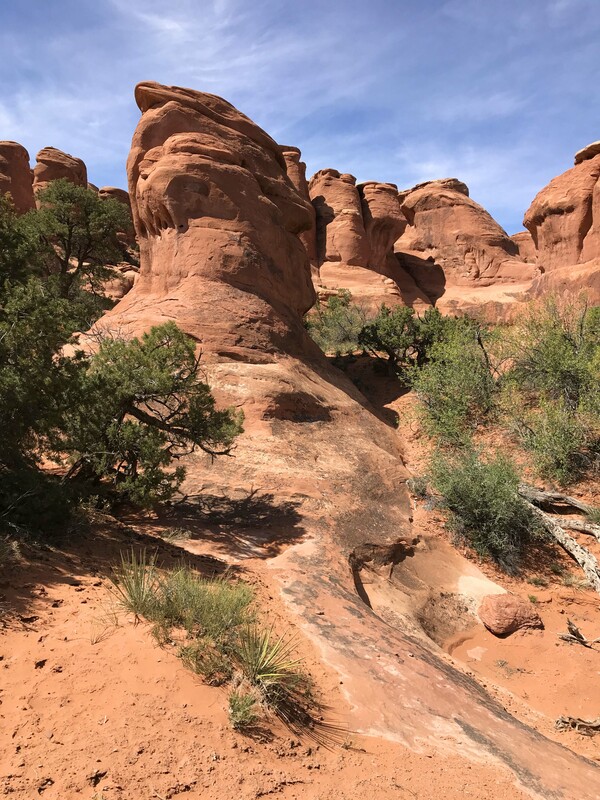 We had seen these kinds of structures all over Utah, but I didn’t really understand that they were hardened sand dunes, which accounts for the cool swirling patterns in the rock. These were really big ones. 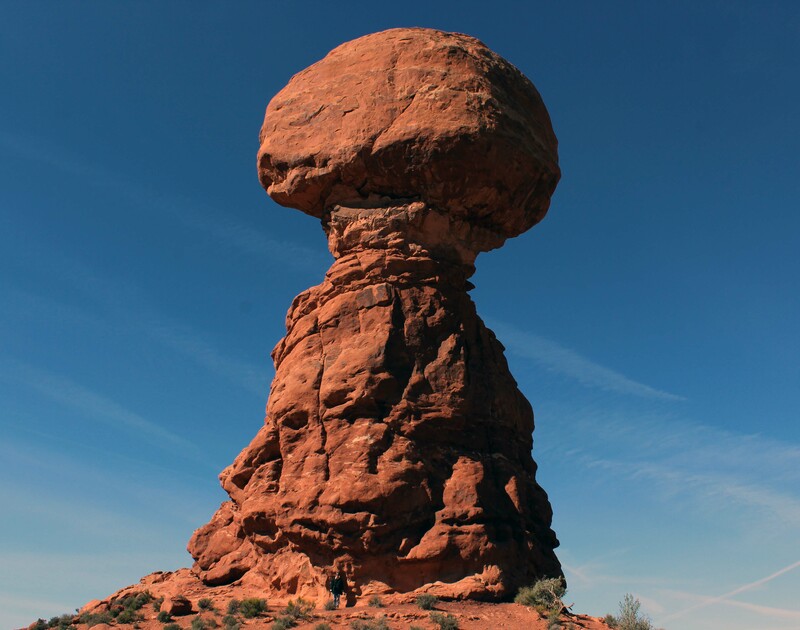 At the T intersection we stopped to see Balanced Rock and took the .3 mile walk around it. I am so very glad we did, because the views are quite different depending on what side you are on and the rock was seriously cool. 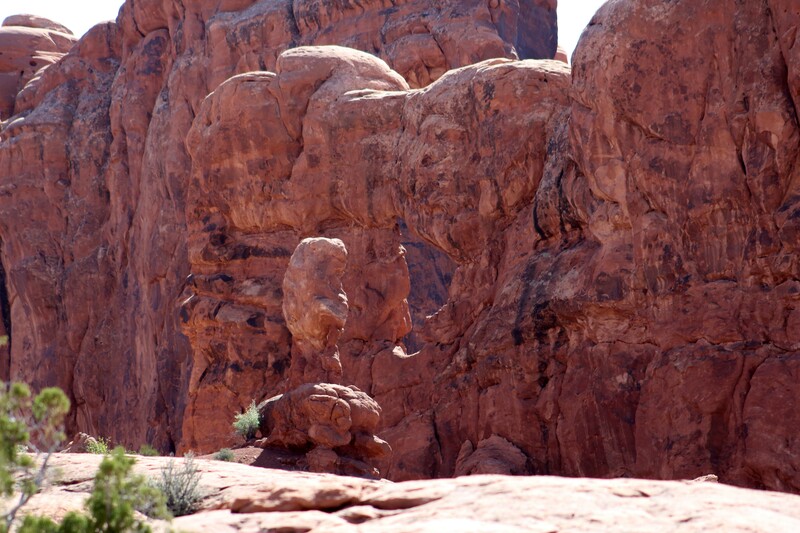 It is 128 feet heigh with the boulder on the top being 55 feet and weighs 3,500 tons. 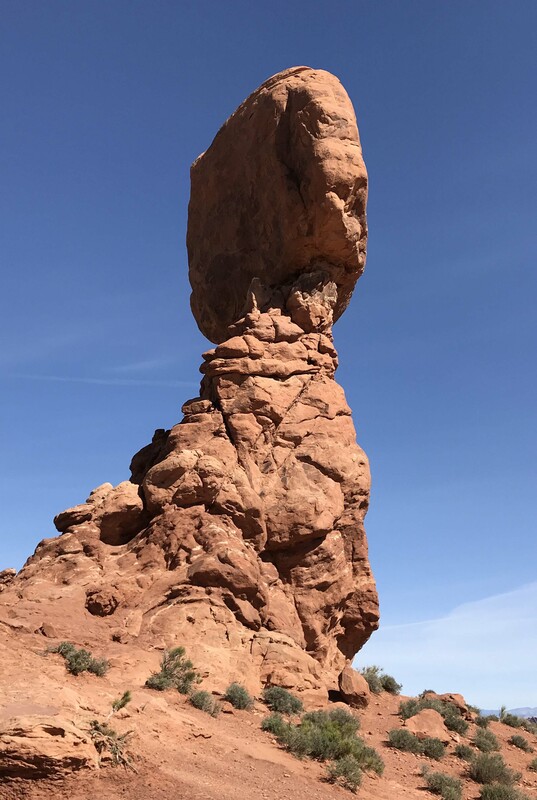 Really loved it, and I have to put this one in the top five rocks I have seen in my travels. Which is saying something because as you know I have seen a lot of rocks. Side view, 3 0’clock as you look at it from the road. The view from 9 o’clock as you face it from the road was the best. 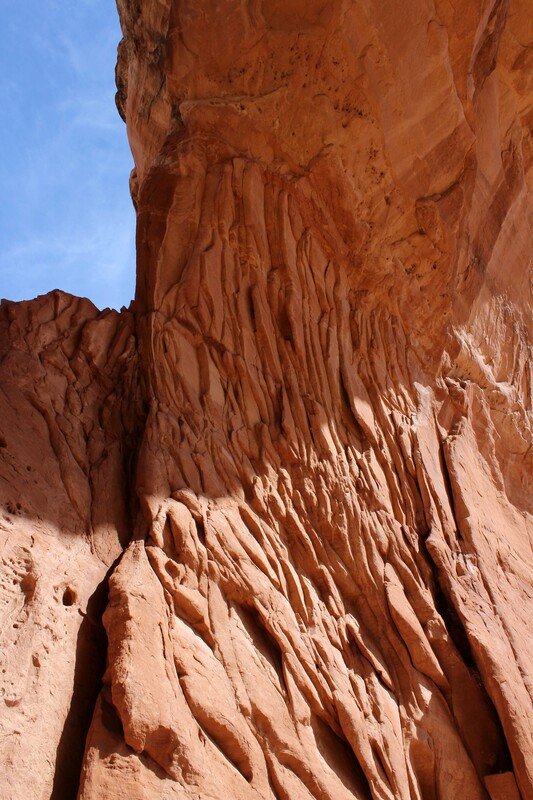 You can see me down in the very bottom for scale. I just had to walk up and touch it. 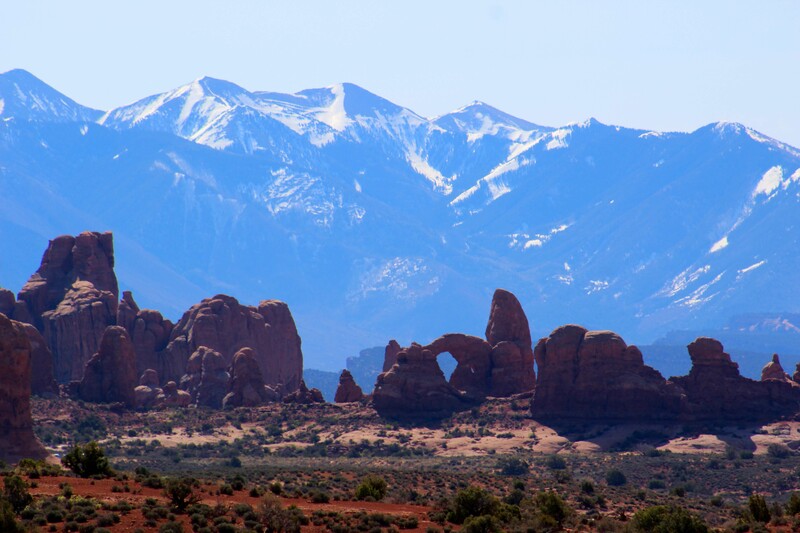 Once we finished at Balanced Rock we took a right at the T intersection heading down towards Delicate Arch. 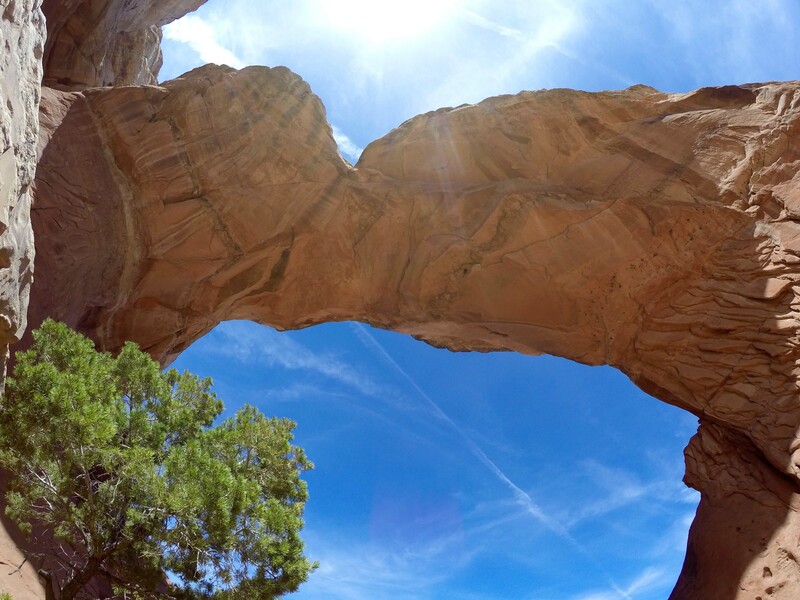 We stopped at first at a pullout and saw pot hole arch, which was really hard to get a picture of because of the angle. Next up we stopped in a large pullout to see the Garden of Eden and almost pulled out immediately when I saw a tiny little hole in the rock and we decided to walk over there. This was actually one of the best things we did, while we were in the park and unexpected because it was a surprise. 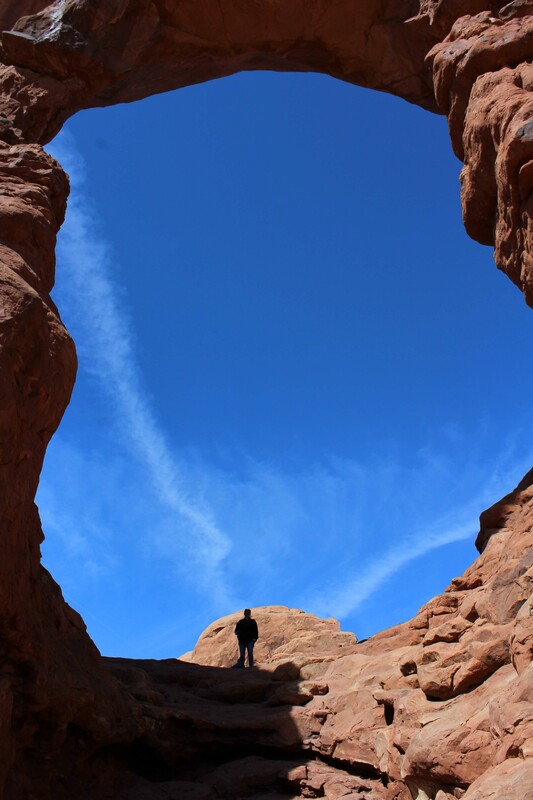 There isn’t an official trailhead here, or a named arch, so it is easy to skip, but we loved walking around inside. I got really good use out of my long lens all day and was able to use it to get a cool picture of the “baby arch” in the garden. 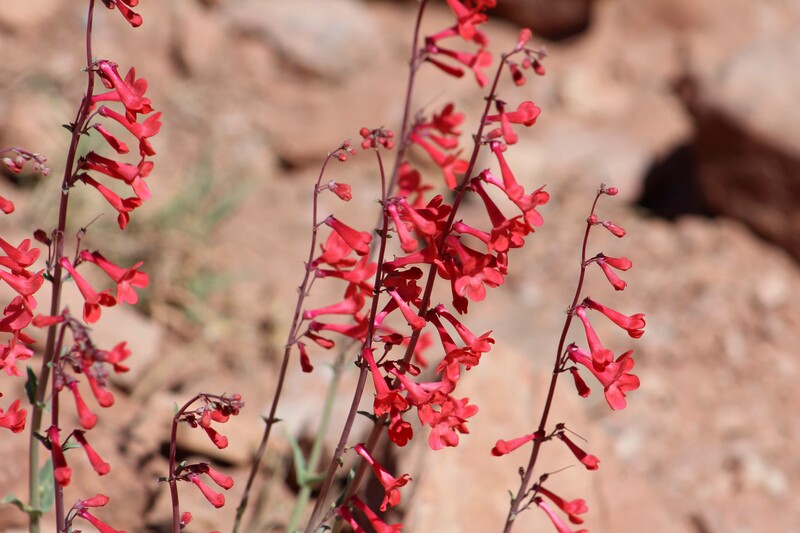 Lee found some beautiful flowers. 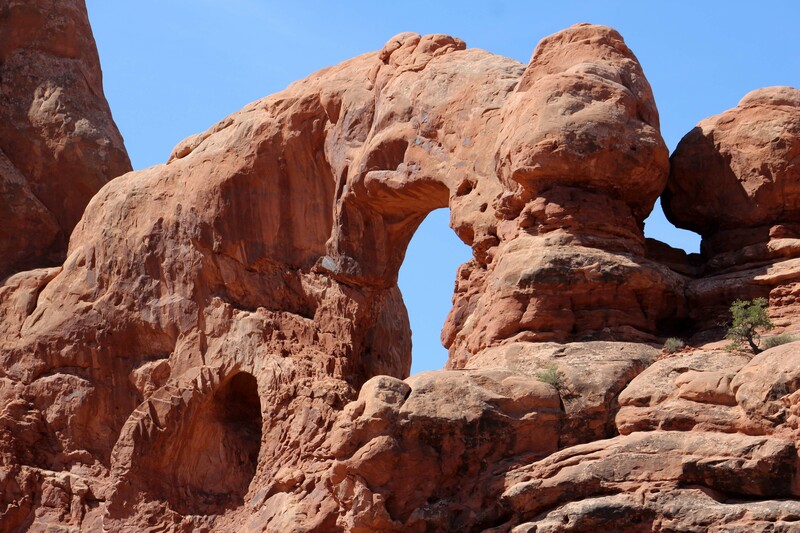 And here’s my shot of the baby arch with the rock. 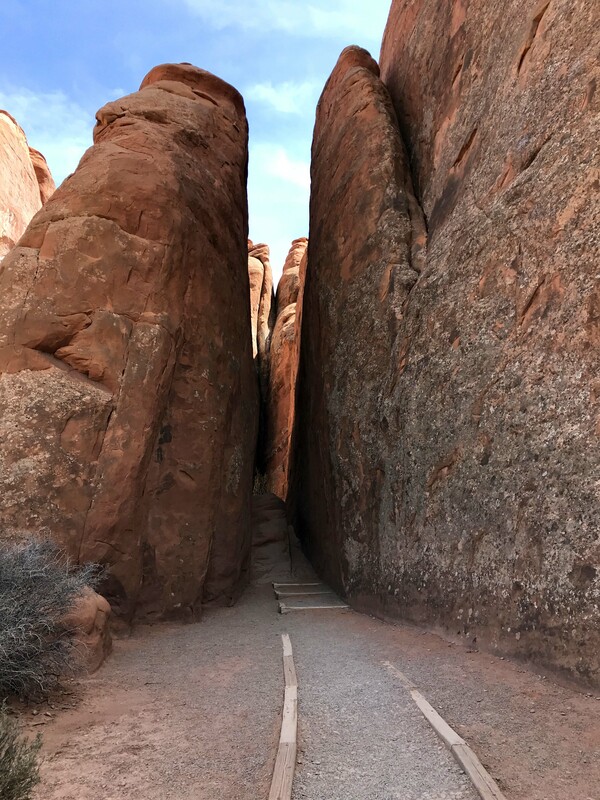 It reminded me of some sort of ancient navigating device (like from the Indiana Jones movies) because the sun hit the rock and cast a different shadow depending on the time of day. After the Garden of Eden we made it to the windows section, and I wasn’t sure how long we were going to walk. 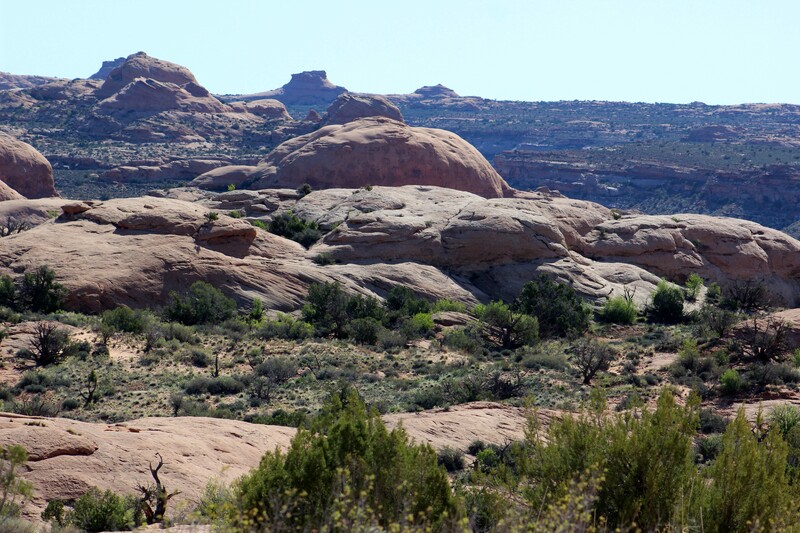 The nice part of this is there are views all along the trail, so you can stop whenever you like. We absolutely loved this section and not only walked all of it, but spent most of our time there. The sun was out, the skies were perfect for pictures, and the crowds were relatively light because it was still early in the day. 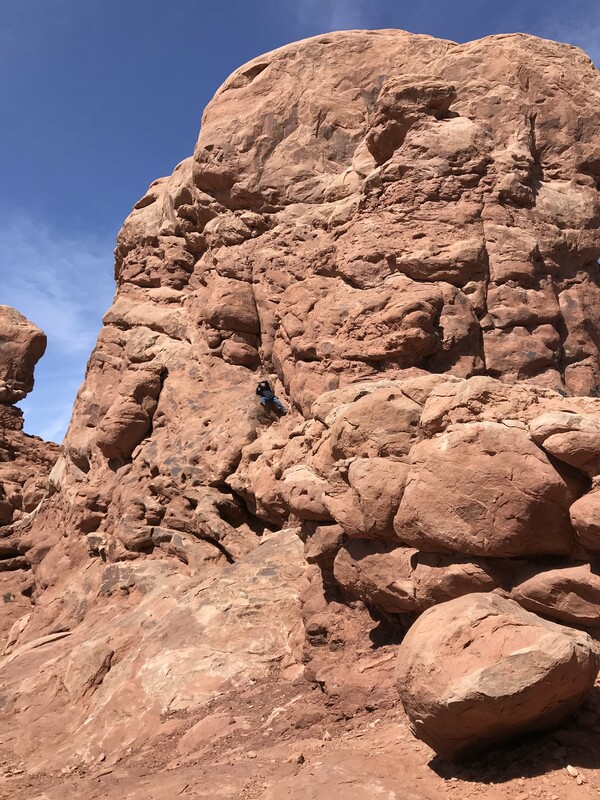 If I could do nothing else in Arches, I would absolutely choose to hike these sections and take the time to climb into the arches themselves. 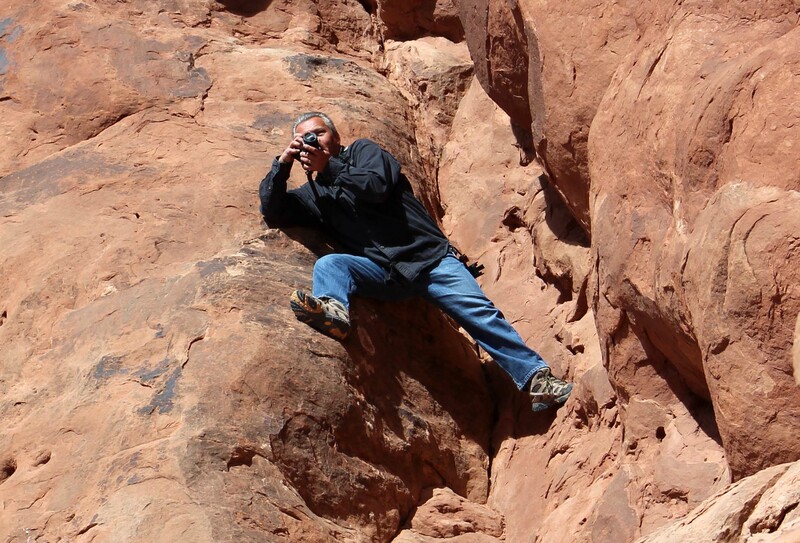 Some of the best views are actually from the opposite side as you will see from some of the pictures we took. 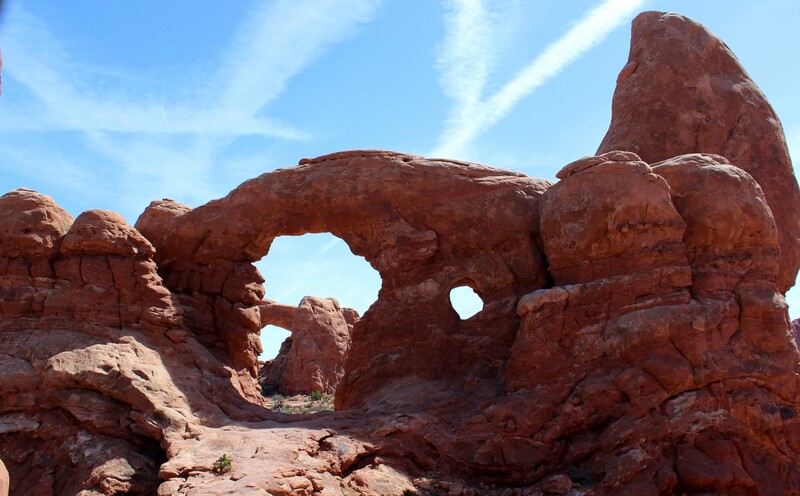 The first arch we came to was Turret Arch which turned out to be one of our favorites of the day. We walked through the bottom and after climbing up a bit made it to the other side. And saw this view, which I liked even more. Here’s his picture. Pretty cool, but definitely not worth him going splat! After the Turret, we walked a little farther and took pictures of the North and South Windows. Individually they were pretty standard arches, but together, they made a really great picture. 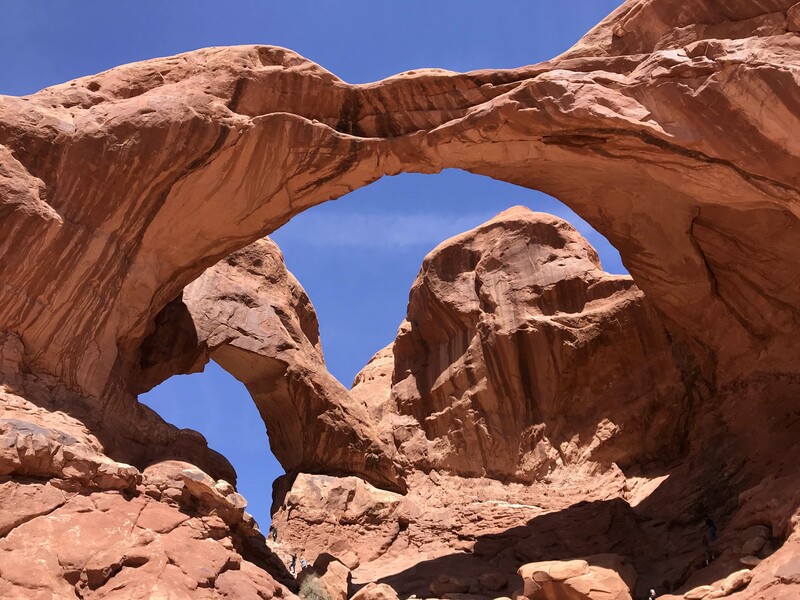 One of the best parts of the stone arches is how they looked from underneath, so for that alone it was worth walking up and seeing it up close. Here are a few pictures I took throughout the day of the undersides. Big crack in this one shows that these won’t last forever. Despite looking solid from far away you can see the details close up, which is why it was worth it to me to walk up and under the arches whenever we could. 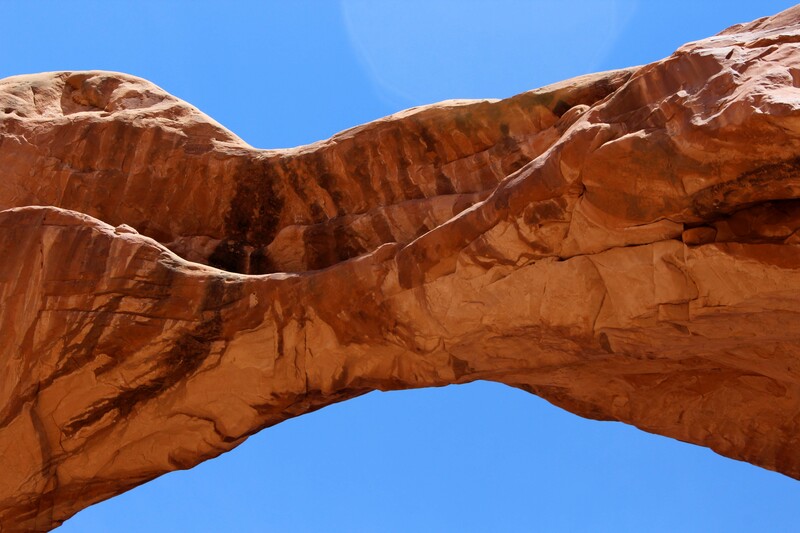 Each arch looks different as different elements conspired over time to create the arch. I found that fascinating. 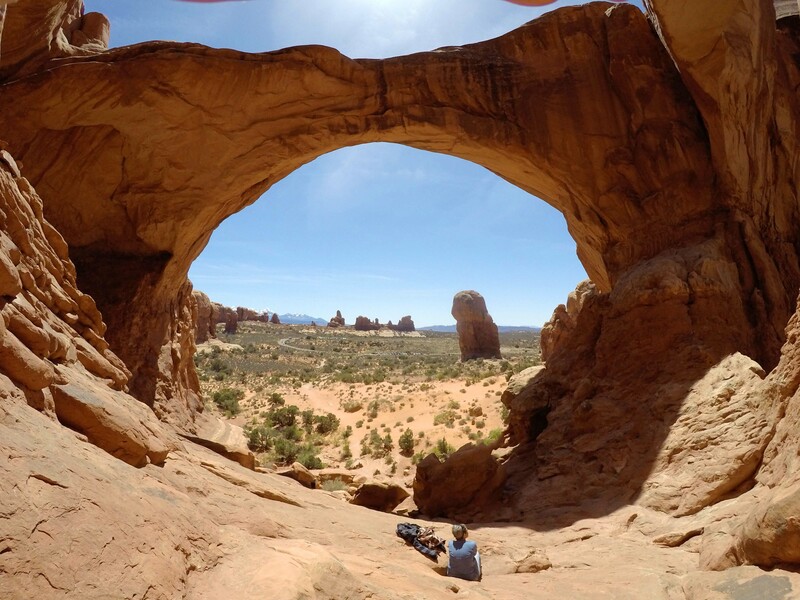 By the time we were done with windows it was noon, and the parking lot was filling up a bit, so we drove down to the second lot and sat and ate lunch looking at the double arch. 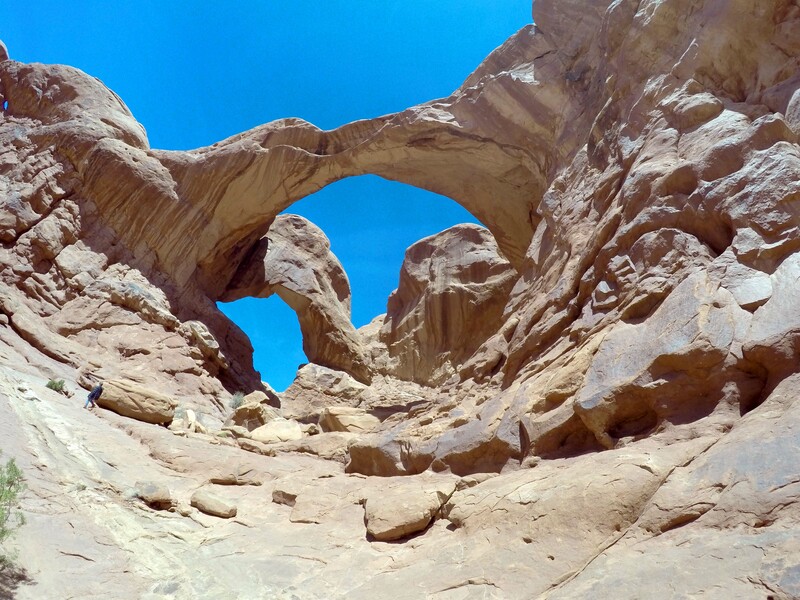 The Double Arch was a pretty easy walk to the viewpoint itself, but to climb into the arch required some scrambling on rocks. It was also pretty crowded, although less people were in the arch, and it was hard to get pictures without people in them. Most of these pics were photoshopped to take the people out, but there weren’t hordes of them, just enough that getting a wide shot without people was pretty impossible. 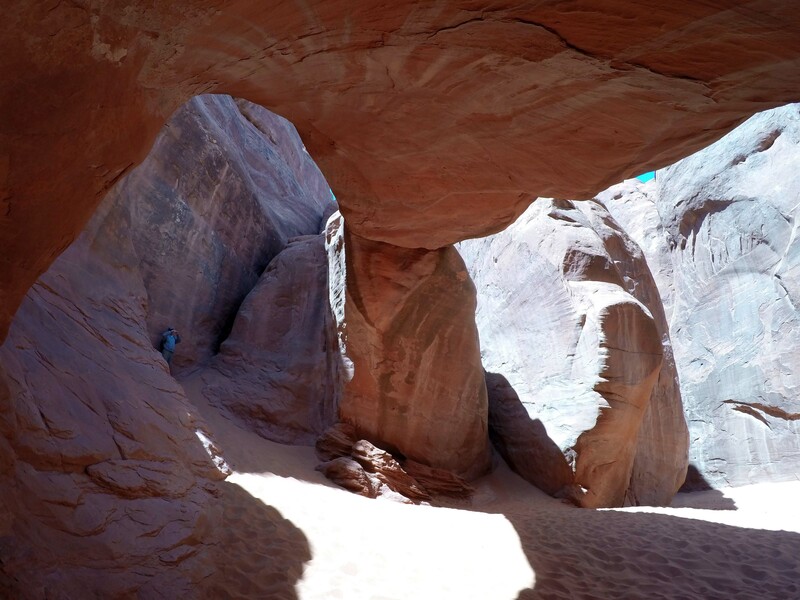 We also spent a long time in this area and I even climbed all the way up to under the arch itself, (taking several stops to allow myself to acclimate to the vertigo) which was no joke and has an incredibly steep drop-off on the other side. I was committed though, and wanted to see the view from up there, and I highly recommend it if you think you can manage it. And this one was mine taken with my phone which did a great job here. 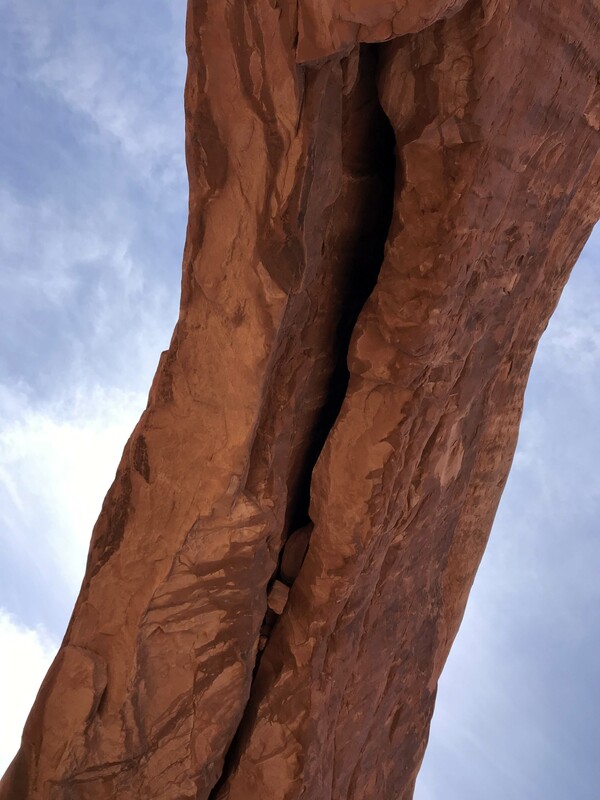 You can see some people in the bottom right corner for scale. And here’s me at the base. I even stood up, but just long enough for the picture. He wanted me to move into the sun but I was having none of that. You can’t see that right behind is a VERY steep drop-off. 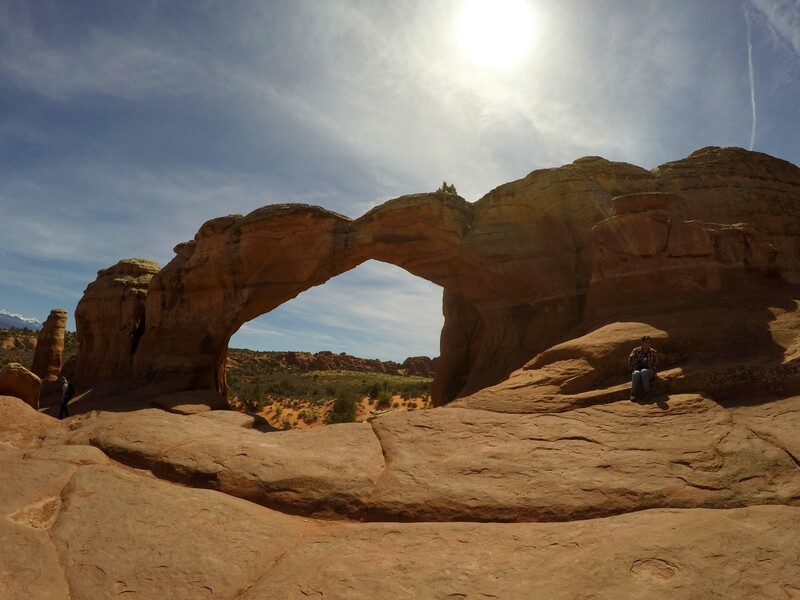 After Double Arch we headed back to the road and stopped at Panoramic Point and then made a right to Delicate Arch. 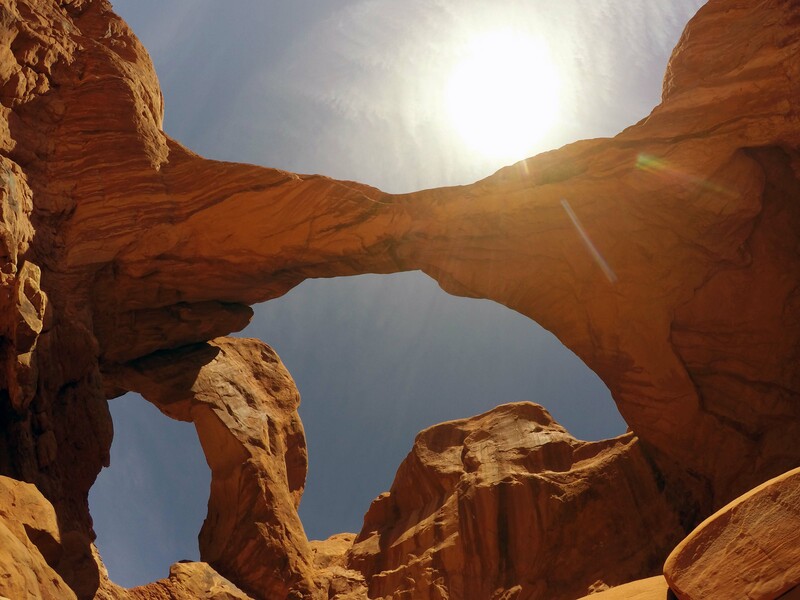 Delicate Arch is the quintessential arch in the park, and there are three different ways of seeing it. 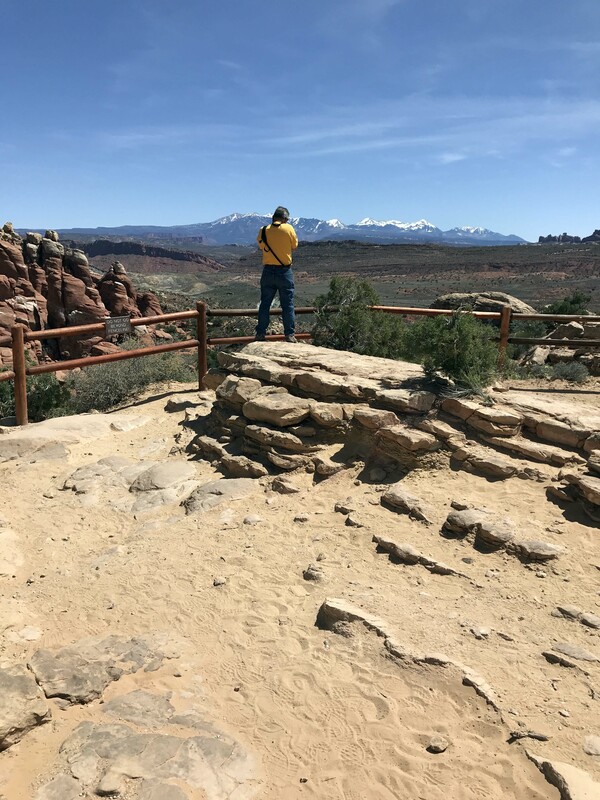 There is a short, paved 100 yard walk to see it from far far away and then a steep and rough climb half a mile round-trip to the upper viewing point. Lee really wanted to walk to the upper viewing area and it was the only climb that I regretted all day. 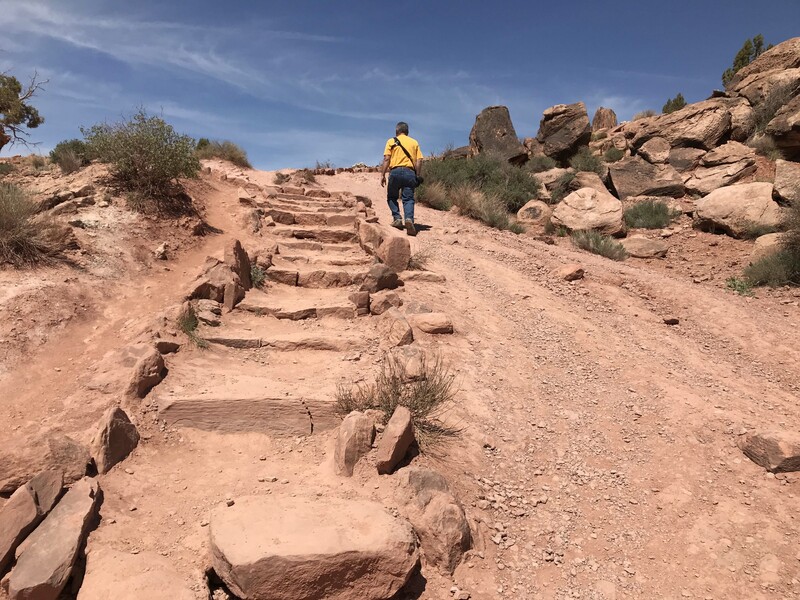 It was steep, the trail was rough, and there was no shade. Worse, I wasn’t convinced that the view from there was any better than at the lower point, and only got a halfway decent picture with my long lens, which really wasn’t worth the climb for me. Here’s the shot I got with the long lens. 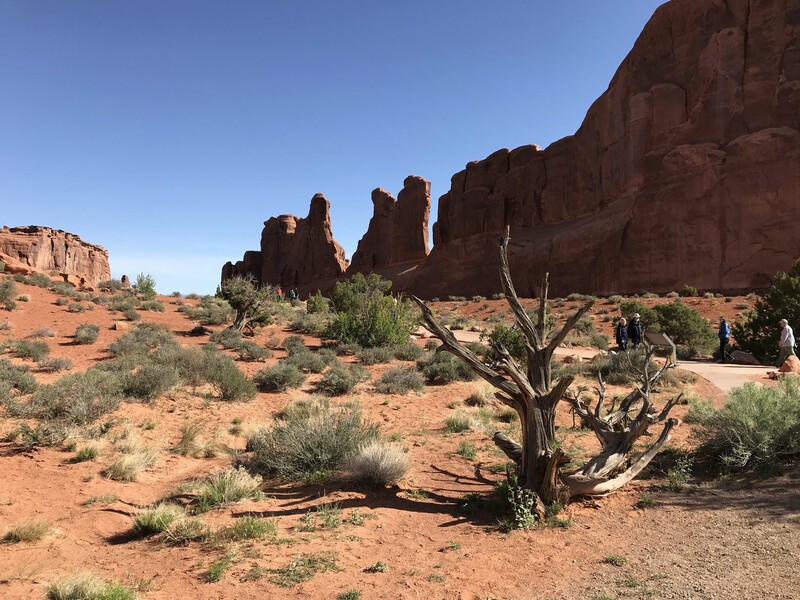 Lee was really bummed when we got back to the truck, because we learned the upper trail to Delicate Arch is 3 miles round trip with an elevation gain of 480 ft and no shade. 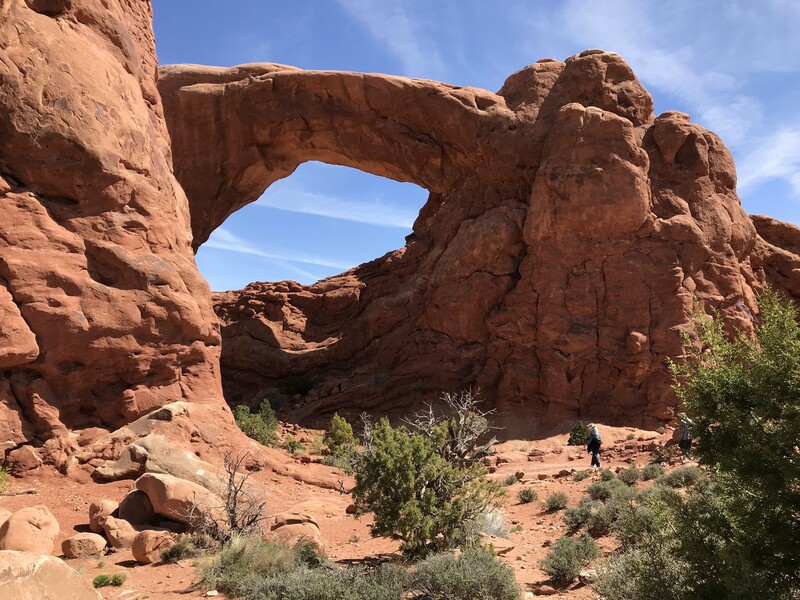 He had seen pictures of the sunrise at this arch, but to duplicate it he realized he would have to walk that rough trail in the dark. I was very clear at that point that I was not interested in that hike, but if Lee wanted to give it a try the next day it was fine by me. 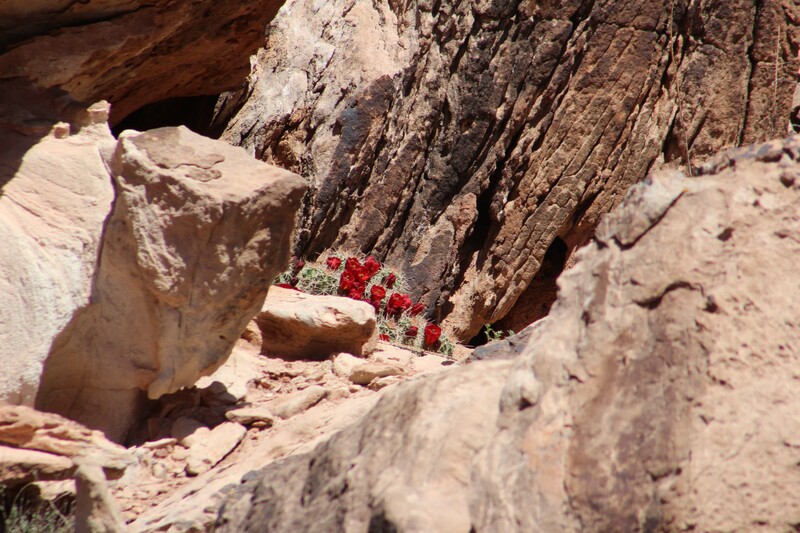 He realized that the hike was probably beyond him, especially in the dark, but that really did not sit well with him at all for the rest of the day. 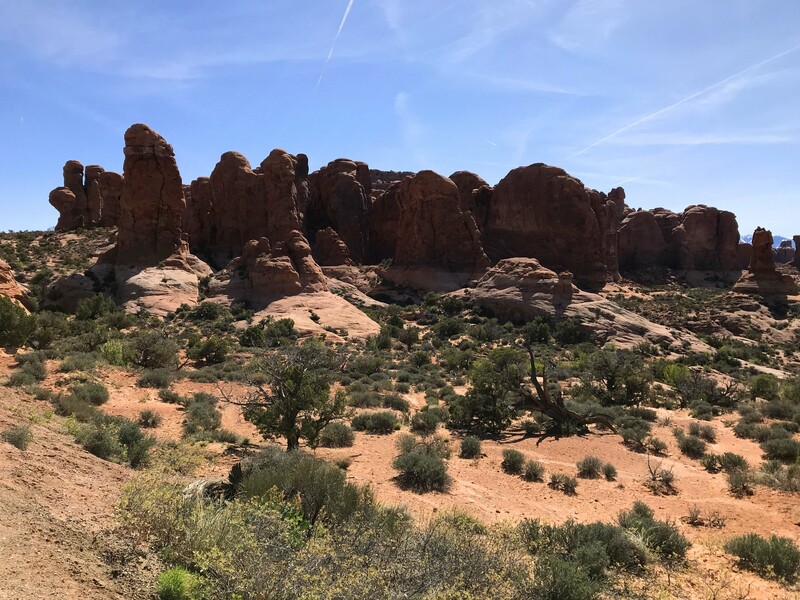 Our next stop cheered me up though, because it was the fiery furnace and there were more of the needles rocks we liked, only closer up. We stopped at the large parking lot and took some pictures and then continued on our way. 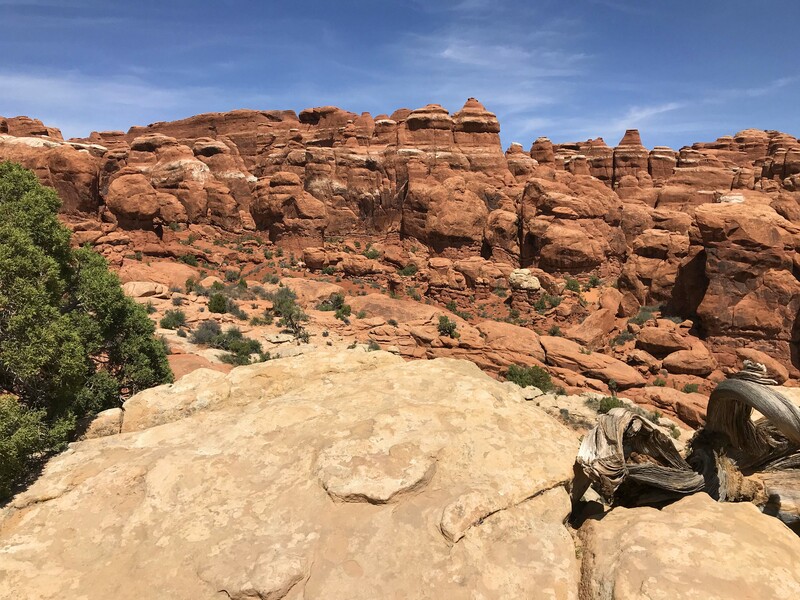 I knew he was still bummed out though so decided I had one more hike in me and we stopped at the trail for Sand Dunes Arch and Broken Arch. 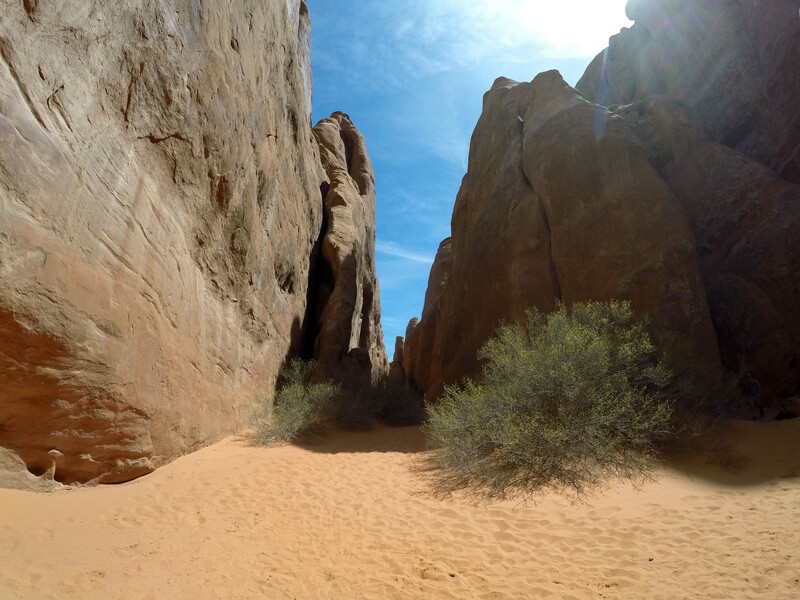 Sand Dune was only .2 miles in, and VERY kid friendly, and we both had fun going through the fin rocks to get back to the arch. 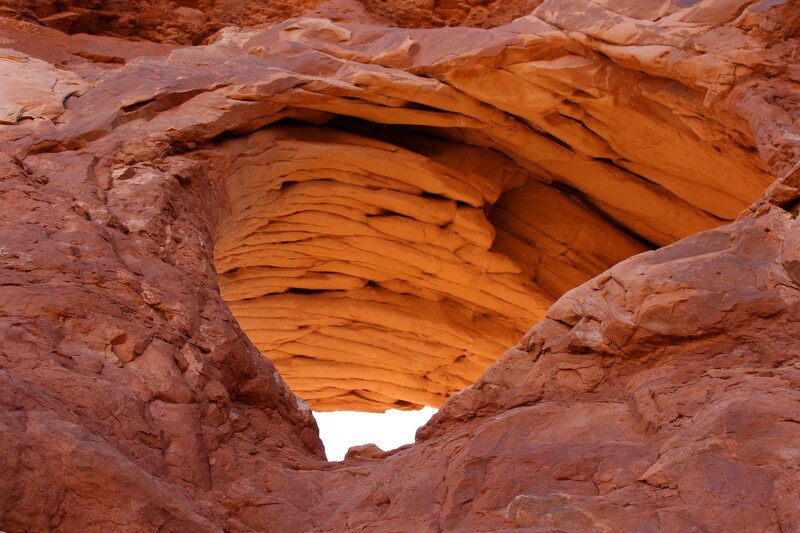 There was a large sand dune that kids were playing on and rolling down and a little cave in the back. Really nice little area for kids and a great place they can explore nature safely. 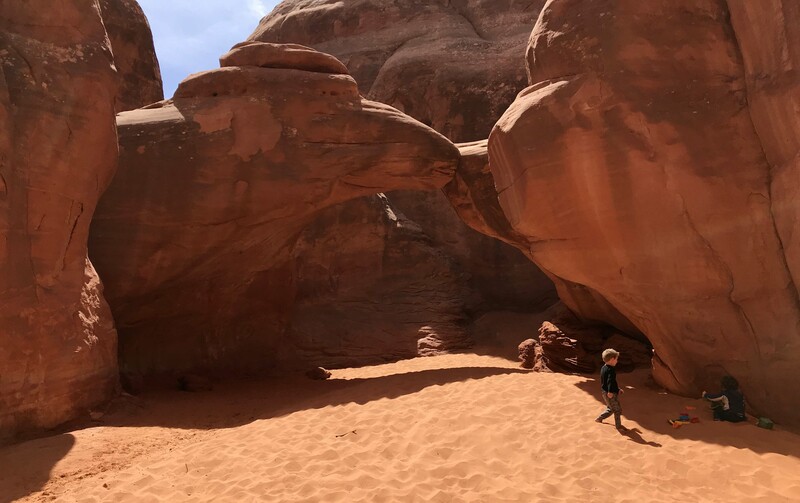 It was a bit loud in there with lots of families so we headed out for the additional half mile (it felt longer) to the Broken arch. 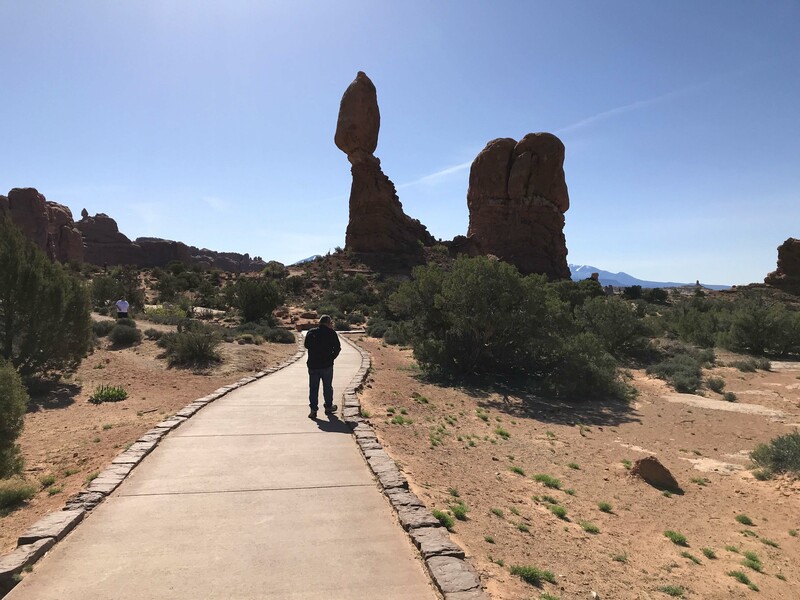 This was a very easy walk, and mostly flat, and the closer we got to the arch the prettier it was. 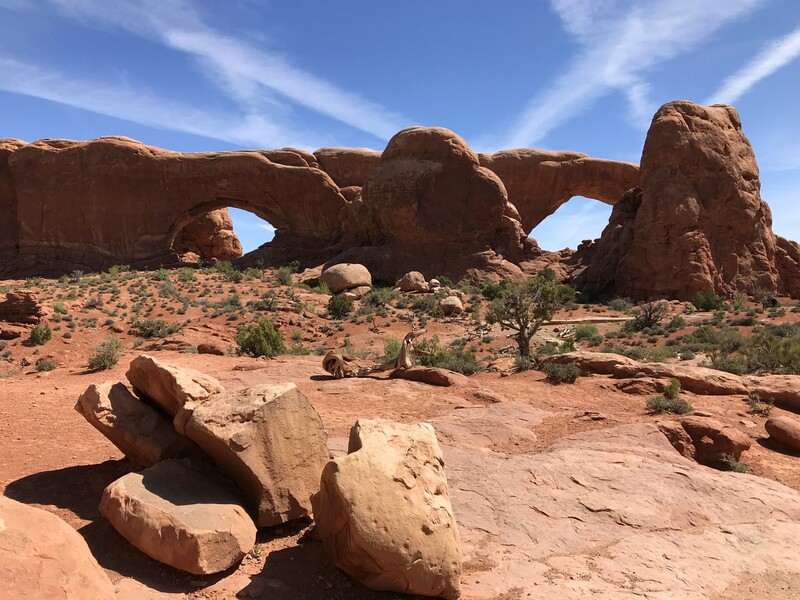 This arch also has the added benefit of a large flat space of rock on the other side, so we got pictures from both sides. As you can see it’s not really broken. After this walk that was it for me though, because my feet were hurting and even Lee said he was tired. 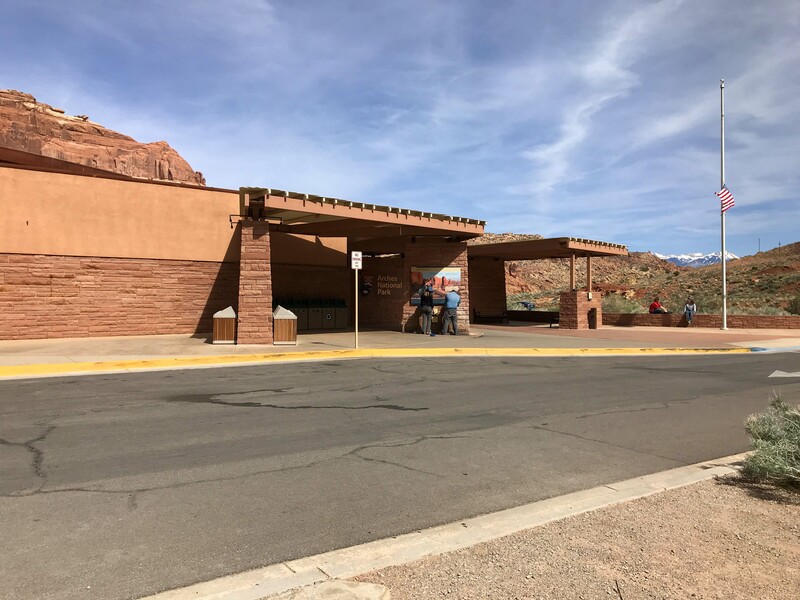 We drove down to the end and saw the large parking lot for Devil’s Garden (which we decided to leave for another day) and then drove back to the visitors center, making it just in time to look around and buy a couple of T-Shirts before it closed at 4pm. 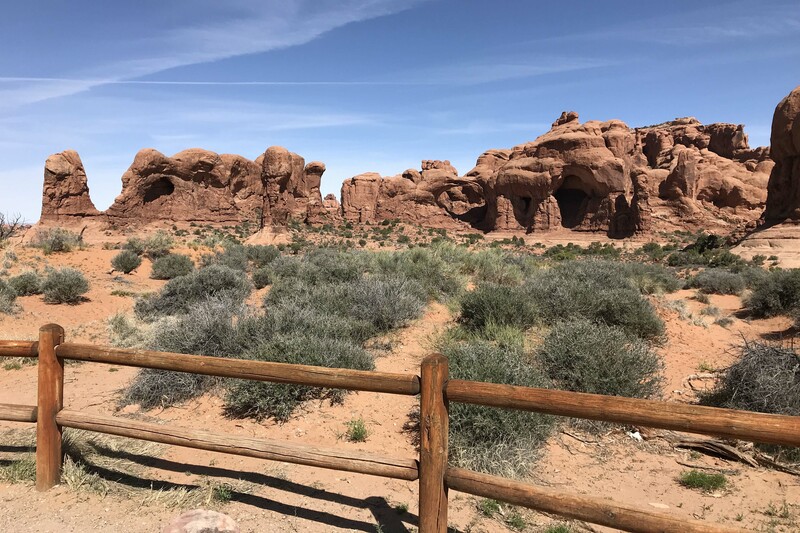 It was a wonderful day, and Arches really lived up to it’s reputation, plus since it was only 8 miles from our boondocking spot, I was totally fine with splitting seeing it into two days. We were both planning on taking it easy for the next couple of days because the pace of travel had finally gotten to both of us and we were tired, but in a totally good way. 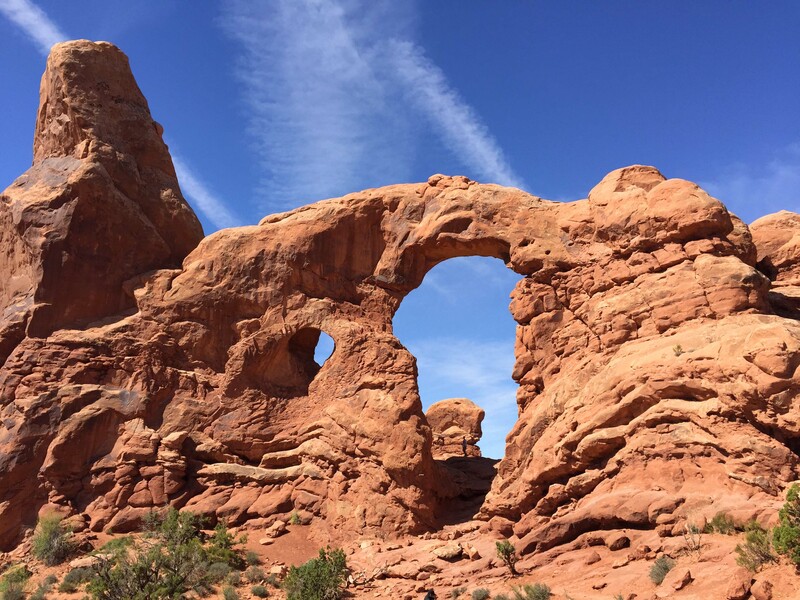 This entry was posted in Lakeside and tagged Arches National Park, Balanced Rock, broken rock arch, DElicate Arch, Delicate Arch Upper View, Double Arch, Fiery Furnace, PArk Avenue in Arches, Pothole Arch, Sand Dune arch, Sheep Rock, Three Gossips Rock. Bookmark the permalink. 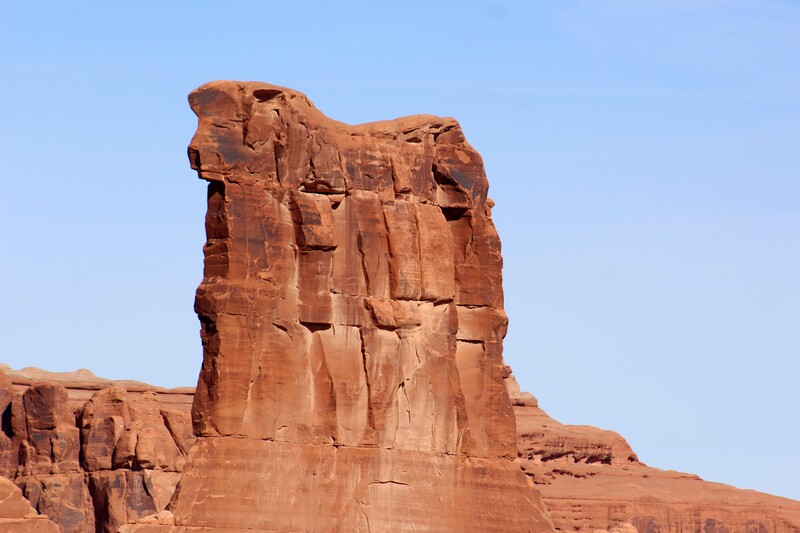 Don’t miss Dead Horse Point State Park. The level walk around the point has beautiful views and a lot less crowds than the National Parks. 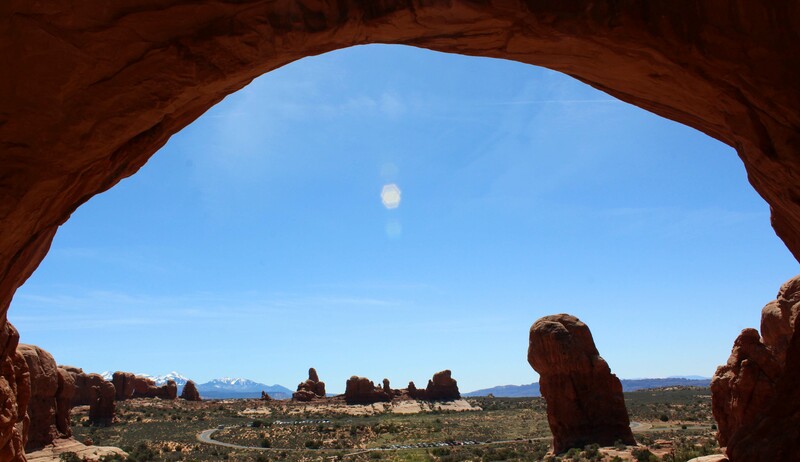 Arches is one of our favorite places. Great pictures! X2 on Dead Horse Point.